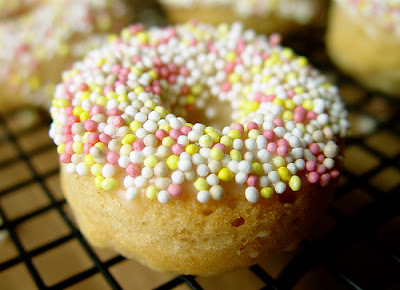 I just sat down to write a post, but now all I can think about are donuts. I was going to write about the lovely walk Lucy and I took today by the river. We even saw Mirjam who I have the pleasure of running into once a week in random places. I keep insisting that she invite me over for her homeland food of Germany. And I was going to write about how I actually decided to listen to NPR for the first time today, but ended up switching to KSL because my intellectual faculties couldn't handle all of the incredible information I was learning in one afternoon! KSL just preaches Republicanism interspersed with traffic reports. So simple. I thought about writing a paragraph about my respect for single parents. Our friend came over tonight, balancing his two kids whom he has custody of right now. His little three-year-old Gwenie asked me to braid her hair. . .
"Oh yes! Too bad Daddy doesn't know how to braid." The whole exchange made me feel so much love for devoted parents. But mostly single ones. A single dipped choc-o-late glazed. I also contemplated writing a thank you to Ric who introduced me to Canada Dry's Bitter Lemon drink last weekend. Sour to taste, naturally pucker-able, where have you been these past seven months?, lemony devotion. But crap. All I can think about are donuts. Labels: Crazy Pants Head, Dessert.